The nationally renowned burger chain opens in Oakwood Mall in mid-April. Offers a wide variety of burgers, fries, soda, hot dogs, and sandwiches including BLTs, grilled cheese, and milkshakes. All food is made-to-order and can be customized with 15 free topping choices. Everything is fresh and never frozen. Popular menu items are bacon cheeseburgers, cajun fries, and the chocolate shake. 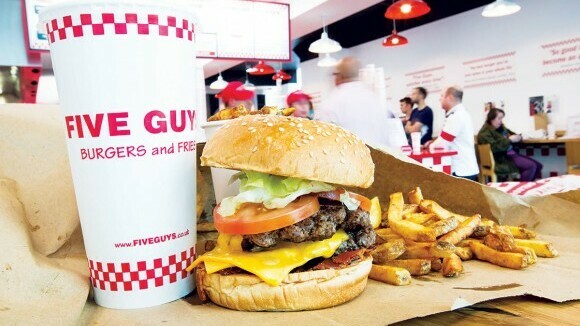 There's a reason Five Guys is pricey- and that's because everything is fresh! This is my favorite place to grab an burger! Cheeseburger with a ton of toppings, cajun fries, and a salted caramel milkshake- it doesn't get much better than that! Double burgers could have used some seasoning, salt and pepper go a long ways. Likewise, the french fries were not salted and were soggy and limp. Although the french fry portions are huge. A large order of fries is enough for four people. All in all, the value is just not there. Almost $40 for two burgers, two large fries and two sodas. Could have gotten better burgers and fries at Amber Inn or the Court'n'house . . . . hell, Culver's is a better value.